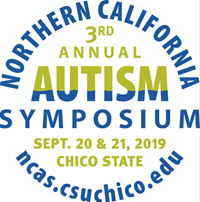 The third annual Northern California Autism Symposium will be held on campus on Sept. 20 & 21. The aim of this symposium is to bring a breadth of speakers and trainers from both inside and outside the North State to present on interventions, services and supports available for individuals with ASD and their families. The program will include concurrent, plenary, and keynote sessions for professionals, parents and guardians of individuals diagnosed with Autism Spectrum Disorder (ASD), and adults with ASD. Past session topics from experts in the field and individuals with ASD have included evidence-based practices, parent advocacy, self-regulation, building friendships, video modeling, and physical activity and exercise interventions. Mark your calendar and visit the symposium website at ncas.csuchico.edu in late spring for additional information.